What is your name in Kanji? Kokeshi in English means wooden doll. Guess what exactly it is? The guy who was selling me it says if it’s not wood, it’s not kokeshi. 😀 I’m not one who buys souvenirs. These are not even souvenirs; I just want to bring home some Japanese tradition with me. 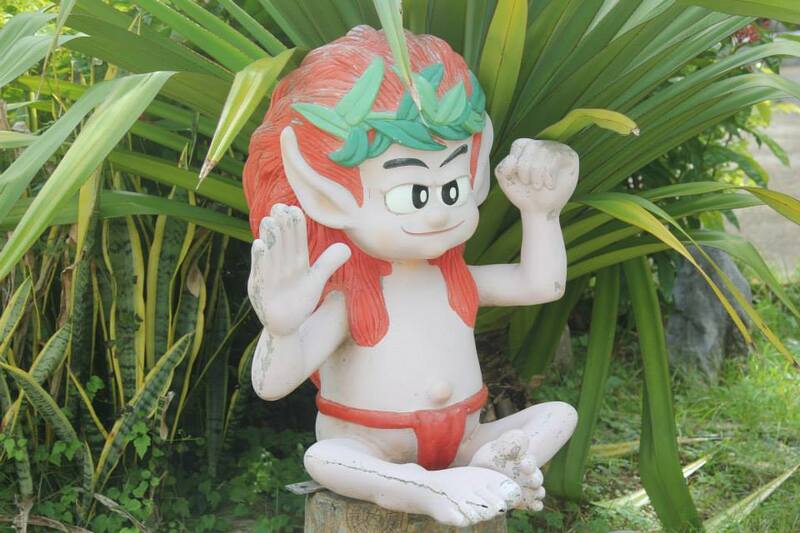 Kijimuna are small wooden mythological creatives, and are strictly Okinawan. They are fishing savvy, but they only eat one eye of the fish leaving the rest. They are known to being mischievous and are pranksters. They make friends with humans and can carry us on their backs leaping through mountains and overseas. Though, their relatonships with humans often goes bad. One story tells of a kijimuna’s friend burning down his tree, so the kijimuna fled to the mountains. I’m not so sure if I want to follow their direction, especially the guy has a big grin on his face. Sorry for the easy post. I thought of composing this when I get back to California, but I couldn’t wait three more months to share about these things. If you want to know more of Japan, Oh My Omiyage is your gal, especailly when it comes to food. Expect magazine-worthy images when you visit her blog. Cocomino!!! What do you mean I became one of Japanese people??? Sorry. It’s all in my imagination. Generally, we think that people who have kanji name are Japanese. Ahhh. I see. 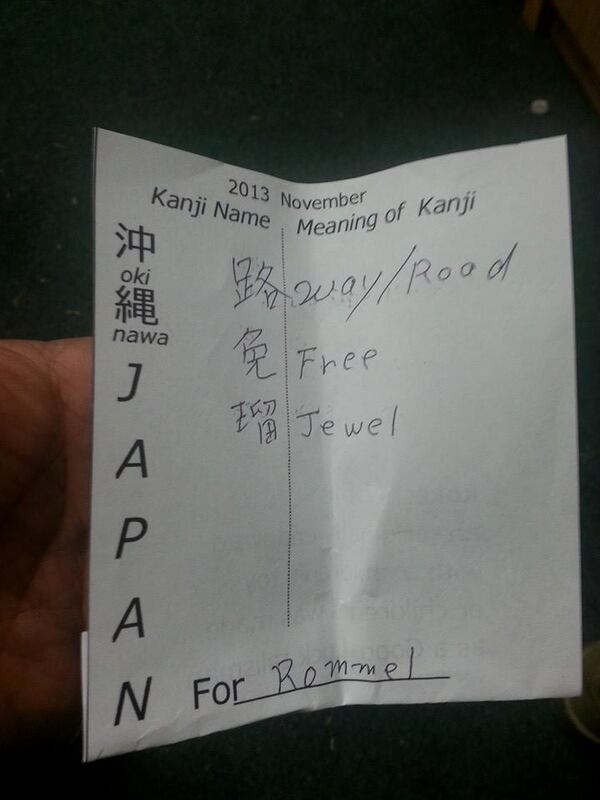 Us, foreigners, don’t really have Kanji names. My name turned into Rumeru. 😀 Still fun to see what our names mean in Japanese. What’s yours say? Did you check your name? I did. You got the best translation. it on my widget 🙂 Thank You, Rommel! Ha ha , I can’t get a Japanese name, not in their dictionary. But your name actually is nice. A free spirited jewel, how about that. Oh so you will be spending your holidays, Japanese style. Bwahahaha, that’s awful you don’t have Kanji name. Ooops I giggled too much. 😀 But wait I googled it for you. 2-away Road, very fortunate name for you. Cool! I actually still remember how to write my name in katakana 12 years after I last lived in Okinawa. I always had to use my Japanese name when I was in Japanese/culture class. Really!? Yikes! Ima have trouble practicing and remembering mine. Cool. 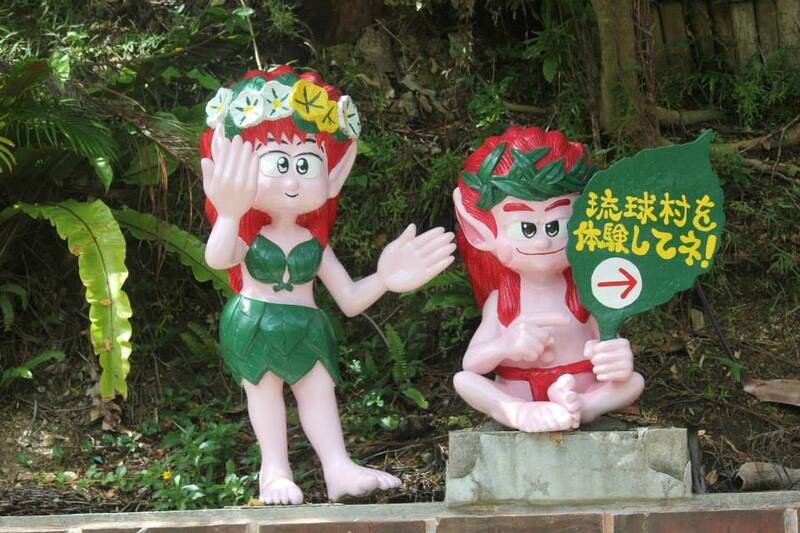 Japan is awesome x 3.
ahaha, interesting! how about this for your name? 露(ro) dew, 芽(me) sprout, 琉(le) as you know, the first kanji of ancient okinawa name, ryukyu. The stroke count of kanji tell you fortune. Find your best kanji name!! Is this a sexist comment about women being seen and not heard?? Hmmmmmm….. Mine is nourishing, jasmine, peaceful. Thanks Rommel, I love the dolls as well. Wait! What name did you enter in? I didn’t see Gilly when I was trying on names. Oh well, yours is really good too just like Amy’s. I had to put Gillian, Gilly is short for it thank goodness! Hey, according to that name translator my wife’s name Kim means “Dream Queen”. That’s so right! I love it! I’ve got to show her that. Ohhhh, I know a Kim as well. Cool! I gotta show her too. I wonder what mine would be in Kanji? Let me find out…Nice! Hi Rommel, it’s always exciting to read your blog! Can I have a request please? Would you mind to write Kabuki? It’s a Japanese theater dance. Ahhh. Didn’t really know about it. I had probably seen one without even knowing it. I’ve always wanted to learn to write Japanese. Interesting photos! Writing Japanese…. Hmmm…. I’m not so sure if I even want to dare to try. I recall when traveling in Japan 30 years ago learning about (not much else) Kanji and Hiragana scripts. There were also some theories floating about that only Japanese people could truly speak and understand the language because of cultural experiences and connotations that one could only learn through living in Japan. Sounded elitist to me, but I just smiled in my ignorance of the language. I recall those wooden dolls, Buddhas in various contemplative and jolly positions, and the yard-art Japanese style gnomes. The Japanese yards range from subtly pruned landscapes to garish colors. When people pride to their culture, they tend to be elitist. Japan has so much varieties and comparison within different cities in itself. You sound like my sister. 😀 Ooops. A souvenir like that sure is a piece to treasure. 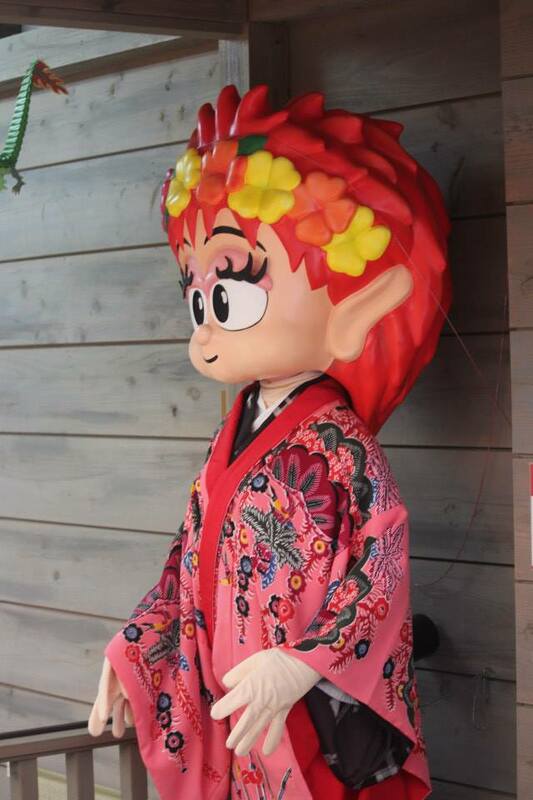 Kokeshi are Japanese while Kijimunas are completely Okinawan. So many K’s, R’s and S’s actually – Shuri, Shishimai, Shisa, and Sunshine :D. Did you check the meaning of your name in Kanji? Emerge – Dance – Orchid. I think I could enjoy going by my Japanese name. 🙂 I love the Japanese dolls. They are delightfully colorful and I’m glad you didn’t wait to share them! Nice share, Rommel! Thanks for that link – it was great, but there was no result for ‘Noeleen’. I went a step further and accepted their invitation to contact them and ask it be on their register. I’d love to find out. I’ll tell you what I learn. These kijimuna sound like cheeky leprechauns :). Only eat one eye of the fish?! It’s been a while since I have caught up on your adventures, we are about half way (hopefully) between reminiscing about our last trip and planning our next, so I have enjoyed absorbing the inspiration of your posts. We have enjoyed a number of trips to Japan (pre Blog), it’s a surprisingly easy trip from Australia and such a fascinating and friendly place. As to our Kanji names, I was interested to see that three of our four family names contained ‘Longevity’, our fourth, my Boy is ‘Peaceful’ and ‘Clever’, although when we took him to Japan at 1 and 2 years old we learned his name translated directly to ‘Ant’ 🐜as opposed to ‘Lion’ 🐯 in Hebrew (and Eagle in Dutch), so he’s pretty free to choose his own course 😃. I’ll be back for more catching up soon. Oh, I think the free way – jewel means your a traveling gem. I love that. I am going to check out what my name means. Thanks for the link. Those cute little Japanese figures are precious. Ahhh… You deciphered my Kanji name meaning. Thanks!